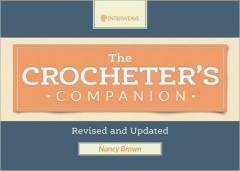 The Crocheter’s Companion by Nancy Brown has been revised and updated to add more tools, stitches, techniques, yarn information, abbreviations, and symbols. It also adds information on reading stitch diagrams and expanded the Tunisian crochet section.The book is hardbound and spiral-bound so it lies flat and can be carried around with you without damaging it.The book starts information on tools, yarns, gauge and tension, how to read patterns, including text ans symbols, what the skill level symbols mean, and how to read a stitch diagram. The next sections cover different types of stitches and techniques, including basic stitches (including chainless foundations and extended single and double crochet), basic crochet techniques, familiar and favorite stitches, advanced crochet techniques, motifs and medallions, Tunisian crochet, decorative finishings, finishing techniques, helpful hints, and troubleshooting. The final section provides a bibliography, associations and websites, and an index. For each stitch type, a description of the type is provided along with text instructions and illustrations for each step. Included are several stitches that I use frequently and was happy to see included: Chainless foundation single, half double, and double crochet; extended single, half double, and double crochet; and working half and triangle granny motifs. The section I found most interesting was the Decorative Finishings one where I learned how to make ring buttons – I’d never have thought that was the way to make them! It also includes how to make covered buttons, attaching buttons, and different types of cords, braids and insertions, decorative edgings, fringes, pompoms, and tassels. The Finishing Techniques section includes how to finish ends, different joining methods, buttonholes – horizontal and vertical, button loops, edgings, blocking, and care. The Helpful Hints and Troubleshooting section provides assistance when working with crochet including foundation chains, turning chains, stitch count, right and wrong side of the work, joining yarn mid-row, and measurements and sizing. This little book provides a good foundation for learning crochet along with different techniques but also is a good refresher for more experienced crocheters. It’s a good size for carrying along with you in your project bag – as long as the bag isn’t too small – to allow for a quick check on basic crochet.